Through the lens I see my daily gifts and am grateful. (Scroll down for blog link you want) Thanks! 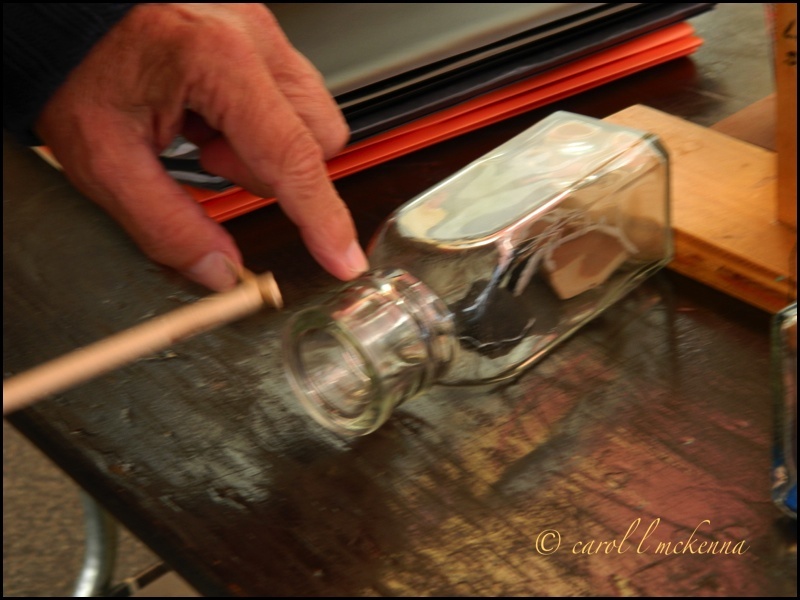 Ever wondered or been asked how a ship in a bottle is constructed? 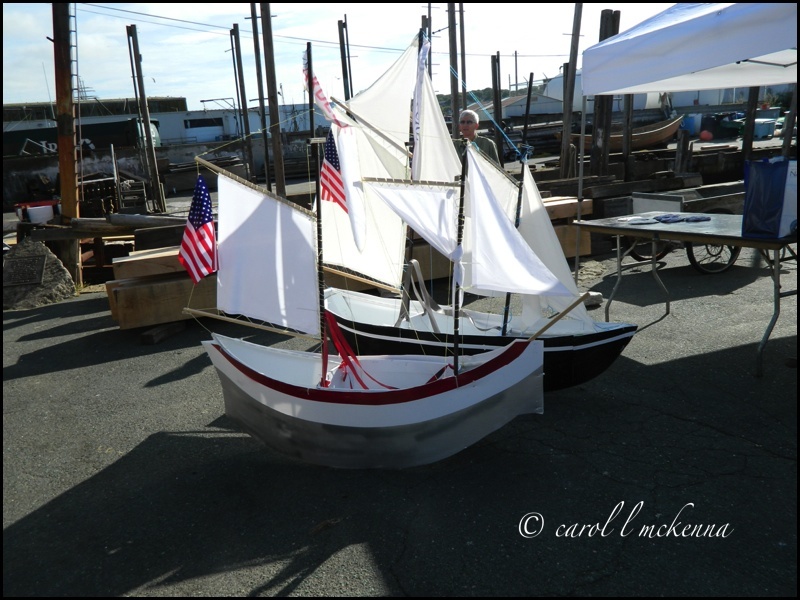 At Cape Ann MA, Maritime Gloucester held a craft fair all related to the ocean. This was one of many artisans there. Your posted comments are always a delight to us. Thanks! Your photos are always great but this post is the best ever I think! I love ships of all kinds and a parade of tall ships is really great. I love the beautiful ships. Great post. What a view you had over those ships. The parade of tall ships must have been wonderful to. Nice photos. 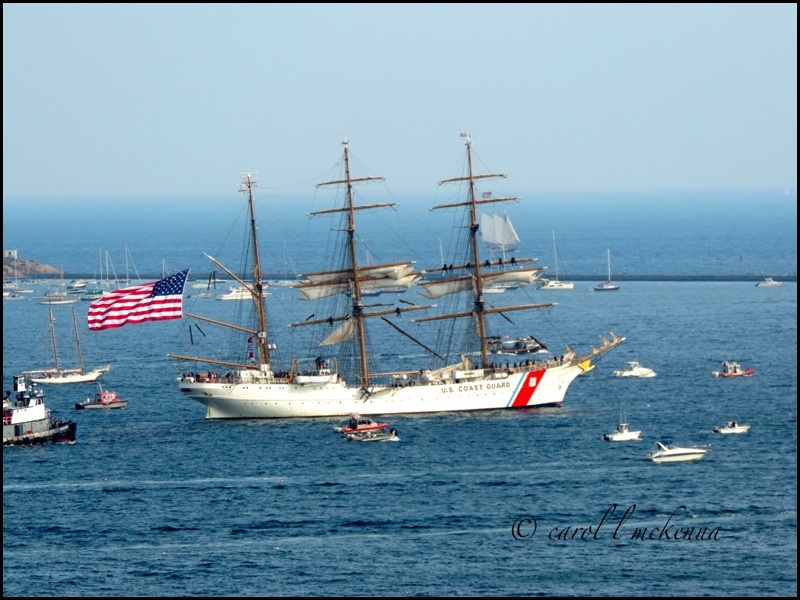 The Eagle sure trumps the Coast Guard vessels I show here! I'm definitely not bored seeing these great ships - that coastguard one is fantastic. Wonderful maritime post! I always look forward to visiting you and artmusedog. Oh the ships are so elegant! I could never bore of seeing the variety of schooners, ships, boats-LOVE them! 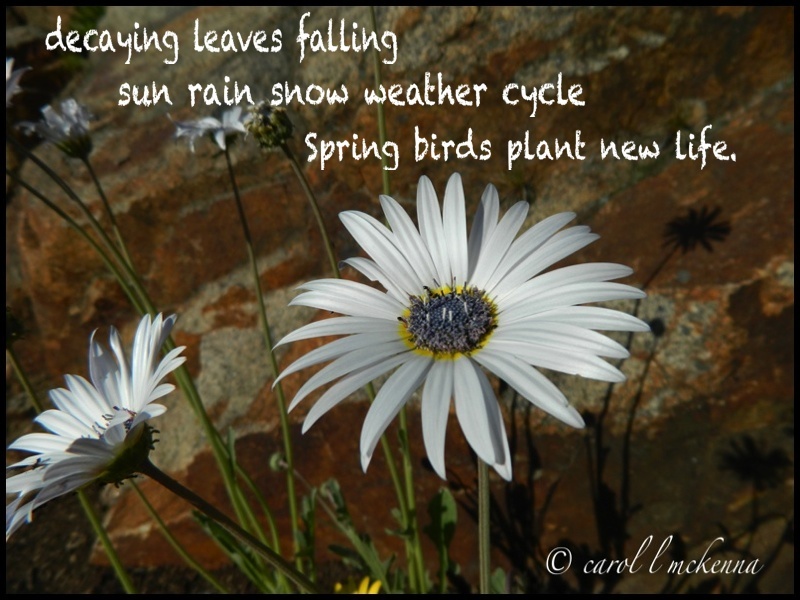 Another lovely haiku for the daisy photo too. Wonderful shots of the ships. carol, the shots are so beautiful. here's a bright September. 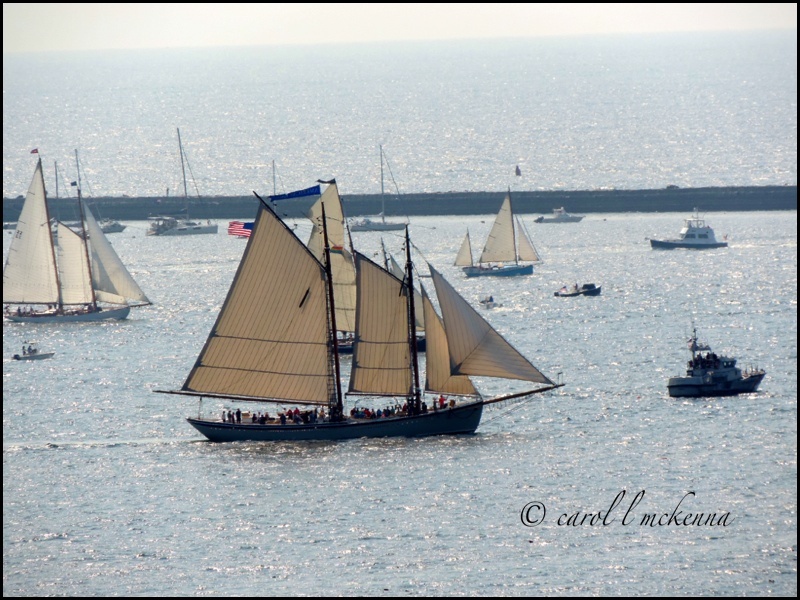 I enjoyed seeing some of the ships in the Parade of Sails, Carol. I loved when this was also done in NYC's harbor. 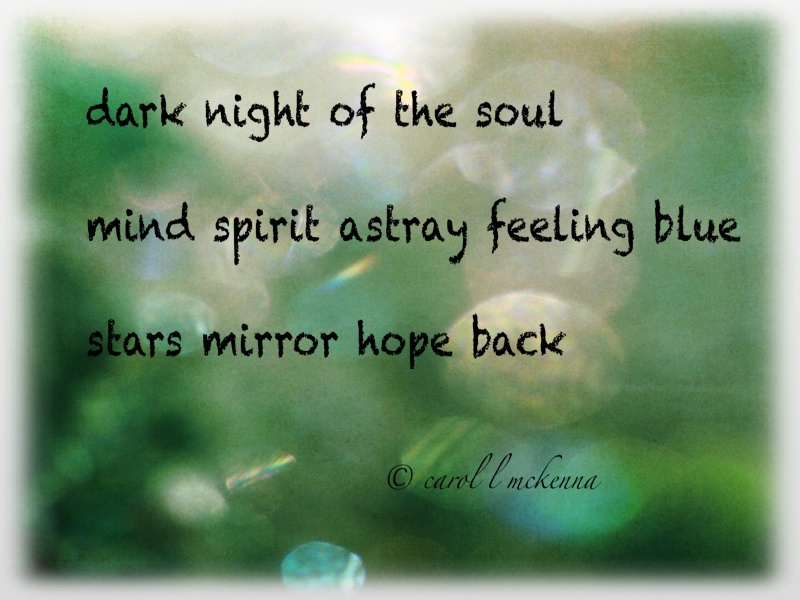 Lovely haiku and a good quoye to ponder! Love the tall ships and your view of the world! One looks in awe at big ships. A travelling hotel and leisure, how amazing! 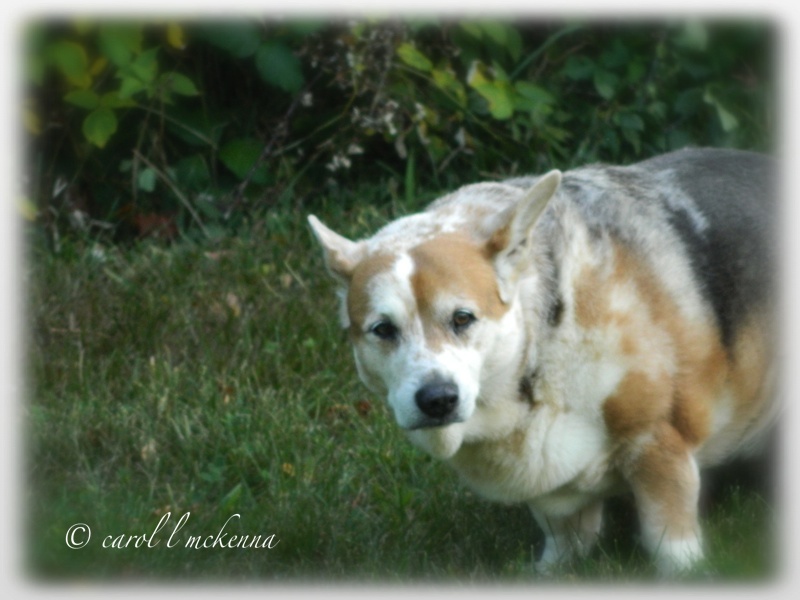 Great pics Carol! I love the ships. They're so beautiful. I never get tired of seeing them. As usual, enjoying everything here. I never get tired of looking at ships. They are so grand and stately. Cape Ann is so picturesque with or without all those boats. Have a lovely week Carol. ps: long time...hope you have been doing well! Wonderful shots, each of them. Such beautiful photo's' I love those sailing days with the tall ships among them. The harbor was certainly full. What a sight. Wonderful ships. we had some tall ships come here last year and it was wonderful to see all those sails and woodwork. Love the water. It is so blue. Beautiful!!! I kept hearing about this, but since I can't stand "local" news, I hadn't seen it. What a sight ~ you must have loved every minute! Carol, those ship photographs are wonderful! My cousin is in Martha's Vineyard, and we love the New England Coast. I also love our harbor here in St. Augustine. There is something wonderful about boats on the water. Thank you for sharing this boat parade with us! And before I forget, that little dog face is PRECIOUS. What a doll! Love the sailboats! The Coast Guard one must be a beauty when all its sails are unfurled! The "Eagle" looks beautiful on the blue water ! Need a trip to the coast, I guess. When I drive to the island from Brunswick, I love to see all the sailboats from the yacht club, taking advantage of the breezes! Great post, Carol. Would be a fun visual treat to watch ships being put in a bottle! ...and beautiful post for SWF too! Amazing ships, glorious skies and terrific captures!! Thanks for sharing the beauty and the fun!! 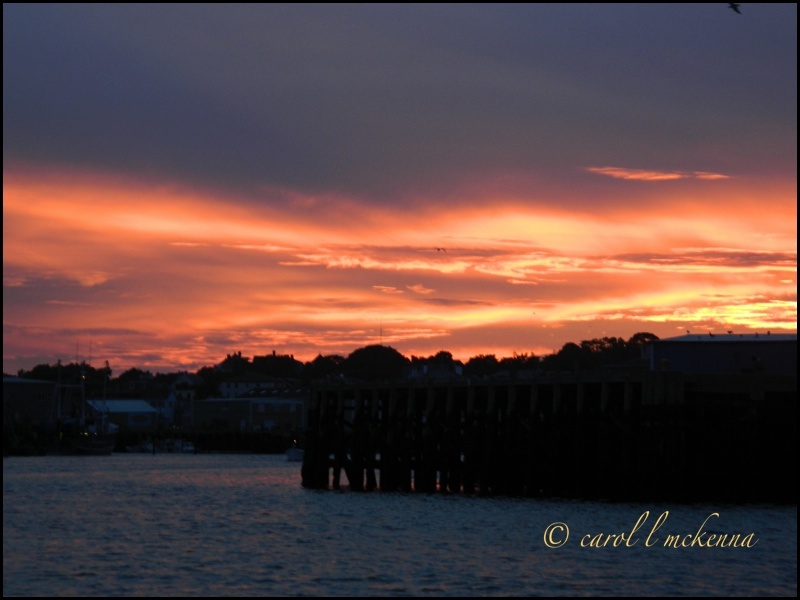 Spectacular sky shot, Carol! I love the warmth of it. Spectacular sky colors in that first photo! Such wonderful photos. I will never ever get bored with your photos of boats and ships and especially your sailboats. I love them. Post some more!! Beautiful haiku also. Wonderful set of images. The first shot is too good. I agree with the rest, a really great series of photographs. Thank you for visiting my blog yesterday. Glad you enjoyed the images. Will visit again. Take care. I love the orange sky. No signs of Autumn until next week, it's HOT here. Every time I come across your blog I spend at least half an hours looking at your amazing pics! Neighborhoods change, and the flowers still bloom. My neighborhood ages, children on tricycles now driving cars, and the flowers still bloom. Thank you for the seaside glories. Sorry for your sad heart at losing your neighbors. Perhaps the new ones will offer new adventures in the neighborhood? Thank goodness that roses bloom, no matter what! Have a good weekend! How exciting to be able to see all those boats on parade and especially the tall ships! 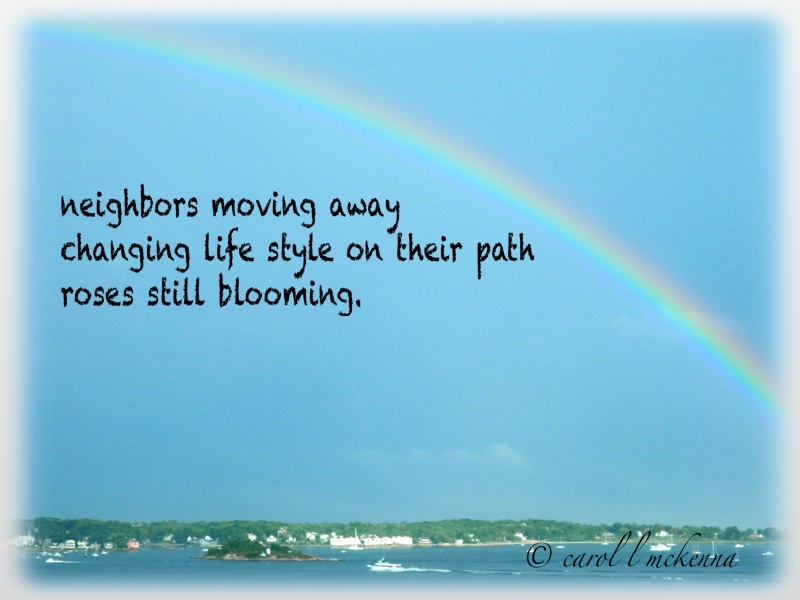 Such a poignant haiku, about neighbours moving away and their flowers still blooming after they have gone. Life does go on, doesn't it? LOVE the tall ships! We saw the Parade of Sail in New York Harbor in 1986 (while there for the re-opening of the cleaned and refurbished Statue of Liberty for her susquecentennial) and again have seen many in Norfolk, Va. when we lived there. They are wonderful! Oh I love it! Great photos. 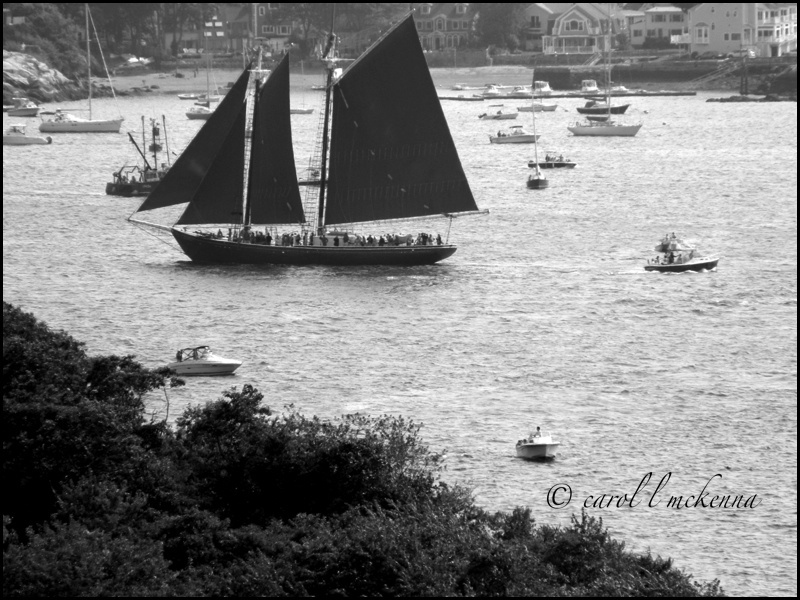 The Parade of Sails was one of my favorite events while I lived on the coast. Wonderful choice for your Haiku, I really enjoy reading what you come up with from the prompts. I know a little something about changing lifestyles. I highly recommend them. They are fabulous opportunities for growth and change even into our retirement years. That first photo is so beautiful! Lovely light in the sky. Beautiful ship silhouettes...poignant haiku with the impending season change/endings somewhere/beginnings in others...the post is alive as always! The Parade of Ships pass through here in mid summer, so amazing to see but we lack the the beautiful landscape you were able to capture. your sweet doggies face welcomes me every week and oh that oldie you got . He looked skeptical . Carol what a great stroll I had here this morning. 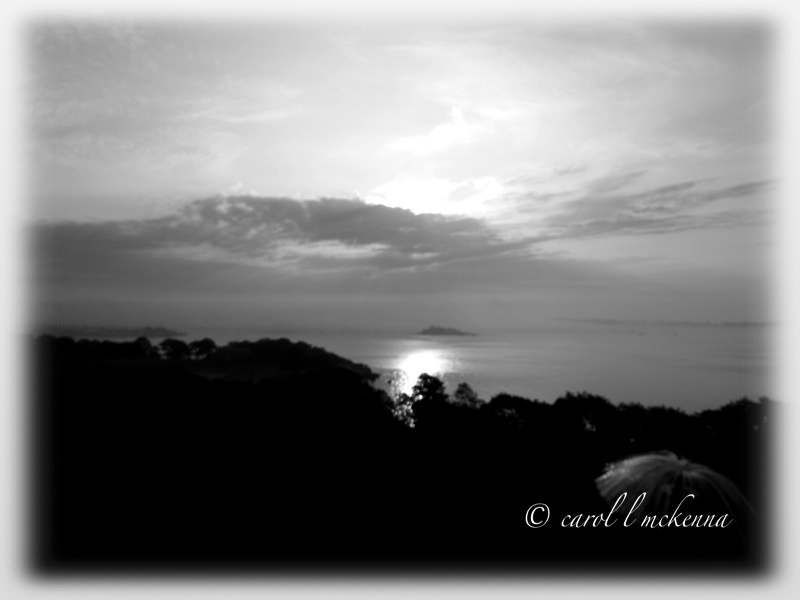 The sun through the clouds photos are especially lovely, Carol. sweet old pup! loved the ships. Lovely photos and how nice to see Character dog. I enjoyed the nautical theme today. Hi! :) Loved seeing the tall ships, and sunsets. My dog doesn't like having her photo taken either, but it's a great photo. I love seeing those tall ships. The dog has interesting and beautiful markings. Such a lovely array of photos! Especially love the sunset! Gorgeous sky! I just love all those ships! Cute dog, and that first haiku is wonderful. Hope you are doing well. Lovely images especially the dog and his thoughtful expression. Cool....I especially like the 'Tall Ships'! 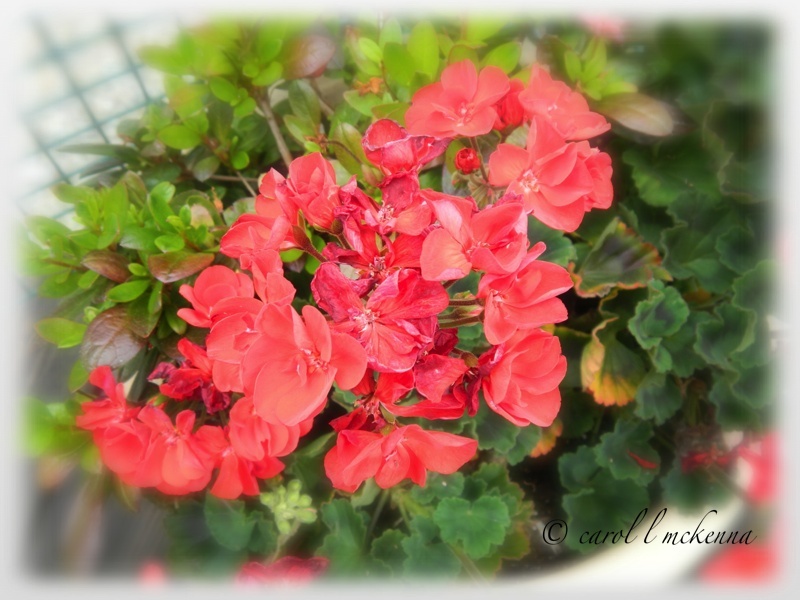 beautiful, beautiful offerings dear Carol! Looking at the stars ... wonderful to get the joy back that way.. they are nice friends to have. Great shots. Thanks for sharing these beautiful images. I love the water. I've never had a chance to spend much time around it! Thanks for brining it to me! Have a beautiful week. Suas fotos são surpreendentemente lindas!!!! Great captures as always ... my favorite is you BW shot! I dont' know if those little sail boats work, but they sure are cute!! I love the toy sail boats Carol! Visiting from Shadow Shot Sunday. You took so many gorgeous shots, Carol! Love all the ships at the harbor! Lovely haiku for Carpe Diem. I enjoyed your photos too. If you are stuck with green tomatoes at seasons end, just put them in a brown paper bag too and they'll ripen up with their own gases. Hello Carol! A lovely series of images! The sky shots are beautiful. And I love the cute dog! 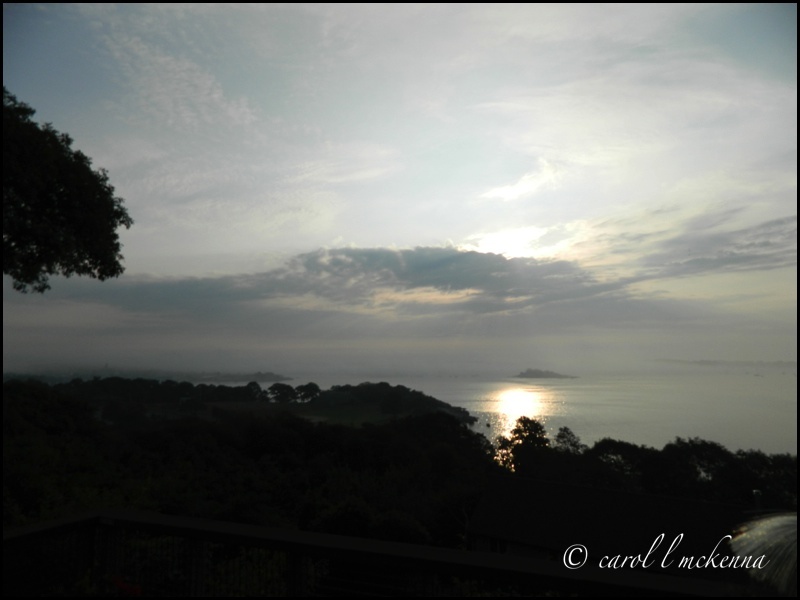 Thank you for sharing your post and linking up! Enjoy your week! I like the ships outside the bottle! Great photos, again.